Marinco introduces combination Dual USB with 12V Receptacle. An expansion of the durable SeaLink 12V product line, the combination Dual USB features two ports to charge cell phones, tablets and other devices powered by USB’s, a blue LED to show that power is available, and a cover to prevent water and dirt from entering the ports. 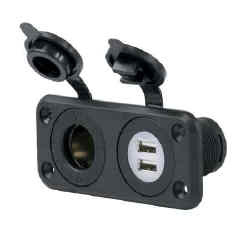 The Dual USB has a 12 to 24 Volt input with a 5 Volt output, a total of 2.1 amps output between the two ports. The 12V receptacle included in the combination SeaLink USB charger, is rated to 20 amps, and is compatible with 12V plugs. These products are ideal for your USB onboard charging needs and designed for longevity in the marine environment.